Sometimes we wonder if we had too much cheese before bedtime and we're dreaming of mad stuff such as Nokias running Android or Samsung making a smartwatch that isn't hideous and rubbish. But no! These aren't fromage-fuelled flights of fancy: they're real! 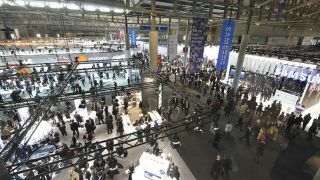 This week was all about Mobile World Congress, or MWC to its friends. It's where the great and the good of the mobile world come to strut their stuff, and that means it's possibly the most important trade show in the tech calendar. Samsung was all over MWC, and while the Samsung Gear Fit wearable was pretty impressive the big news was the launch of the Galaxy S5. The launch wasn't a surprise, and neither was the phone: surprisingly, it turned out to lack any surprising new features. It's the iPhone 5S to the Galaxy S4's iPhone 5, a device that "takes the DNA of [its predecessor] and improves on it in most areas," as Gareth Beavis reports. The gimmicks of the S4 are gone; this time "the phone has focused on what users might actually want." It doesn't reinvent the smartphone, but it has "a great camera, strong screen, impressive packaging, a waterproof casing and a blazingly fast engine pumping things along." This year's trend appears to be waterproofing. The S5 won't be damaged by a dunk, and neither will Sony's rather nifty Xperia Z2. If you're thinking, "hang on! Didn't Sony release a flagship phone just a couple of months ago?" you're right - the Xperia Z1 has barely cut its first tooth. "And yet here we are at MWC 2014 seeing the Xperia Z2, and it's a much better handset," Gareth says. If you thought the Z1 was pretty good, the Z2 is better still. The camera's better, the performance is fantastic and the screen's lovely. Sony had another Z2 to show us too, the Xperia Z2 Tablet. Like its similarly named smartphone sibling, the Z2 tablet is a sequel, and once again there's more power, more RAM and a nicer screen. The speakers are better too. It's not going to set the world on fire, but that's because "Sony had already overachieved on that front in 2013." The Z2 is "a really great tablet." Motorola had some nifty things to show us too. The firm formerly owned by Google had a "tigerish" MWC, Patrick Goss says: we "saw Moto variously hitting out at ugly wearable tech, announcing that a Motowatch was on the way, insisting that leaving Google was a good thing and laughing off questions of Motorola's demise. Another big name came out swinging at this year's MWC: Nokia, which unveiled its Nokia X range of smartphones. The phones run a forked version of Android, which is interesting when you remember that Nokia's currently being acquired by Microsoft. The phones are pretty nice, but don't expect to see them in your local smartphone emporium: they're aimed at the same developing market where ultra-cheap Android phones are selling in huge numbers, and the use of Microsoft services such as Outlook, Bing and OneDrive means they might act as an on-ramp for Windows Phone. "Microsoft could actually benefit from Nokia's experimentation with Android," says Max Slater-Robbins: "all profits… go to Microsoft without having to spend money on building the features Android has and Windows Phone lacks." In a world where "Microsoft's services are its future, having hardware that supports that is no bad thing." Remember HTC, which used to set the Android agenda? These days it can't even seem to get its product names right. HTC Desire 816, anyone? The name's a shame, because "there's plenty we love about it", says Hugh Langley: it looks nice, the screen's sharp and it has dual Boomsound speakers "for those spontaneous disco emergencies." Ah, but can it survive in space? We strapped James Rogerson to a space rocket to find out. No, not really - but we did ask him to find out how well smartphones could cope in orbit. The answer, it seems, is not very well: thanks to space monsters, radiation and extreme temperature, space isn't the best place for a smartphone. No, not even a Samsung Galaxy.